I was finishing up my freshman year as a double major in public relations and modern languages at the University of Miami and started thinking about applying for internships. While I’ve heard these terrible, terrible tales about family and friends’ internships, I still decided to hand in my resume and hope for the best. Sure enough, shortly after sending over my resume, I got a call that I’d been accepted to join the RockStar internship program and that they would be expecting my arrival at the beginning of May. My first day, I arrived at the agency promptly and was introduced to everyone. Right off the bat, I was included in a meeting and given a project to lead and complete within a week. Excited, I came home and told my family and friends all about my first day and how busy and interesting it was. The next couple of days, weeks, and months were the same. My second week at RockOrange, they hosted a Team Building Event at one of our client’s super cool locations – Zoological Wildlife Foundation Miami – where we got to play with tiger cubs and find out about my teammates through some fun challenges. Tt was then that I thought this internship exceeded everything I had hoped to accomplish during my time here. I got to really know everyone in the office and make friends. 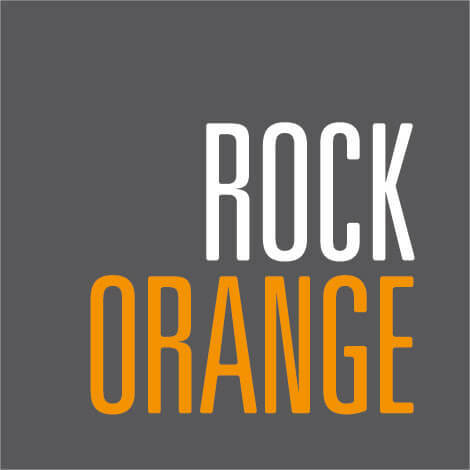 I wasn’t just “the intern,” I was Nicole and sometimes even “Coco.” RockOrange is a family, not just a company. I was included in meetings, e-mail threads, and important conversations. I was kept in the loop and always had something to do, which never happened to just be “clean the bathroom” or “go get me some coffee.” I learned more than I could imagine learning in just three-and-a-half short months. Though I had spent two semesters of studying public relations at the University of Miami, I learned the tricks of the trade very quickly here at RockOrange. Pitching, press releases, and media lists became daily tasks, not just a far away tale of something they taught us at school that we may or may not have to do when we actually enter the field of PR. I felt so accomplished using my knowledge from my class and putting it to use here with an actual, real life client. I’m very grateful to say that I had an excellent internship experience this summer. I’m sad to see my time come to an end at RockOrange, but I’ll always remember what I’ve learned here and the people I met here. I can’t wait to come visit again soon. They say the view from the top is the best, but the view from the bottom can be pretty good too. How Can You Have Fun With Your Brand? Did you see the Michelle Obama episode of Carpool Karaoke? If you didn’t stop what you’re doing immediately and click on this link. So did you get it? Her message that is. Nestled in between her flawless rendition of Stevie Wonder, Beyoncé inspired dance moves and surprise appearance of Missy Elliott, FLOTUS took full advantage of the opportunity promote her initiative to support the education of girls around the world – Let Girls Learn. And with over 32 million views on YouTube to date, not to mention all those who tuned in to watch it on The Late Late Show, the reach of that message has been amplified far beyond traditional marketing methods could have taken it. Now, we might not all have the influence of Michelle Obama, but it was an important lesson for brand marketers in that you’ve got to give yourself permission to have fun. And that’s why it inspired this week’s ‘Question-of-the-Week’ – How can you have fun with your brand? The marketing landscape is evolving rapidly. The rise of the always-on, constantly connected consumer means that campaigns need to evolve and be dynamic. They must live where the consumer lives (which is mostly digital) and speak to an audience whose loyalty is built through a more personal social engagement versus the hard-sell mentality of more traditional advertising. That’s why brand marketers are looking to step up their collaboration with agency partners. The complexity of what is required to design, execute, and report on multi-touch, multi-disciplinary marketing campaigns requires more resources and knowledge than ever before and those skill sets, and time to execute, often live outside of in-house capabilities. As agency partners we have a commitment to our clients to help them not just stay on trend, but to keep one-step ahead of those trends, and to deliver campaigns that will help build brand loyalty with our clients’ target audiences. That’s why we need to know our ABT’s. We need to Always Be Thinking for and on behalf of our clients to ensure that we continue to demonstrate the value of the agency-client relationship. Here are some ways we think you can do that. Recent years have seen the growth of real-time and responsive marketing as brands look to create shareable, relevant content that places the brand at the center of unfolding social conversations and viral trends. To do this successfully requires marketers to think on their feet. 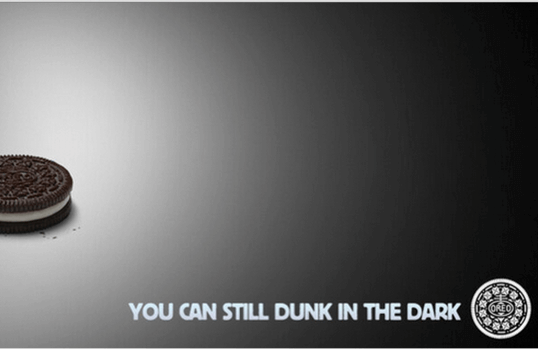 Response time is key and the benchmark was set by Oreo during Super Bowl XLVII when the lights in the stadium went out for 34 minutes, enough time for the brand to ideate and post it’s now infamous ‘dunk in the dark’ tweet. Another more recent example of the value of this responsive marketing approach is how brands have quickly capitalized on the Pokémon GO craze. With more than 7.5 million downloads of the game in the U.S. in the first week alone and with users spending more time playing the game than on popular social apps including Snapchat, Twitter and even Facebook, creative (and quickly executed) campaigns like the ones in this Street Fight article from brands including Applebee’s and Virgin Mobile are driving huge amounts of foot traffic and conversions. 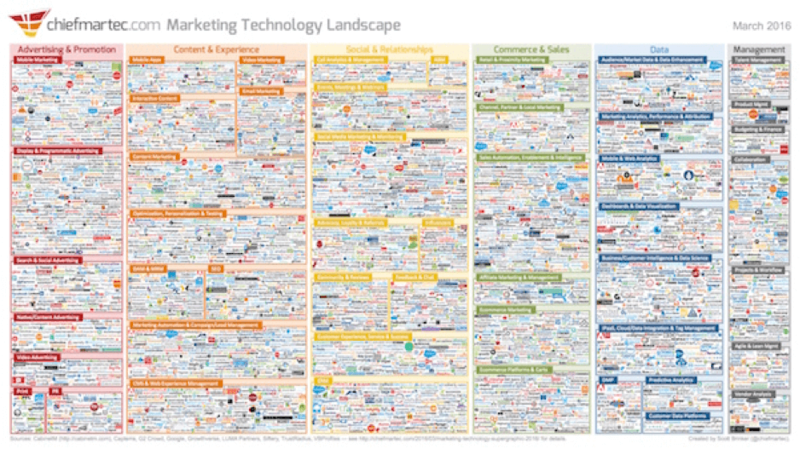 With a whopping 3,874 marketing technologies represented on a single slide, Scott Brinker’s Marketing Technology Landscape chart is the best visual representation of just how complex today’s marketing landscape has become. As agency partners it’s our job to help our clients navigate these technologies, understanding what’s going to work best (and by work best I mean provide the best ROI) for the campaigns being designed. It’s also our job as agencies to keep abreast of new technologies and leverage them to our client’s advantage. And I’m including social media in the bracket of technology. While Snapchat may be the social channel de jour (here are four great Snapchat marketing case studies from The Content Strategist,) there’s always a new social app or feature round the corner – you’ve just got to keep thinking outside the box with the application. For example, before the official release of Facebook Live, RockOrange incepted and managed the first-ever Facebook Fashion show to promote the launch of our client Macy’s Hispanic-backed clothing line – Thalia Sodi for Macy’s. The show aired live on Thalia’s Facebook page to millions of fans around the world and RockOrange reached across social media platforms and promoted the hashtag #thaliaformacys, which became a top trending term during the event and in the hours that followed. Last but not least, don’t forget to share your thoughts and ideas with the client. Because if a great idea happens in an agency but no one tells the client did it really happen? Nine times out of 10 the client may reject your idea for reasons including lack of budget or that they don’t feel it’s a good fit, but that one time they say, “go for it” gives the agency the chance to really prove added value and potentially get a new piece of business. In the midst of a controversial Republican convention where speeches, good and bad, are not just being used to sway people’s divided vote but, in our digital age, providing the social universe with a slew of memes, gifs and trending topics on a scale never seen before in a U.S. political race, we took a step back this week to consider the power of great speeches and what makes them just so. Click through to watch our video where we ask our RockStars – What Makes a Great Speech? Frances is a seasoned publicist who specializes in media and influencer relationships that organically grow brand footprints in U.S. Hispanic and Latin America markets. She comes to RO after five years of agency experience. She has worked with a slew of Fortune 500 clients, including McDonalds, Target and AT&T. While engaged with McDonalds, Frances helped create public relations and social media campaigns for the company’s education, food and music platforms. Most recently, Frances helped MasterCard promote financial technology and electronic payments as a preferred method of payment in Latin America. Frances’ deep understanding of how to connect a brand’s values with Hispanic consumers makes her a valuable new member of the RO team. A graduate of the University of Central Florida, Frances is an avid writer and part-time fashion blogger. Her blog, Mystylesnapshot.com, is a series of dispatches from Frances’ inner “fashionista,” where she details and documents trends in the fashion world. 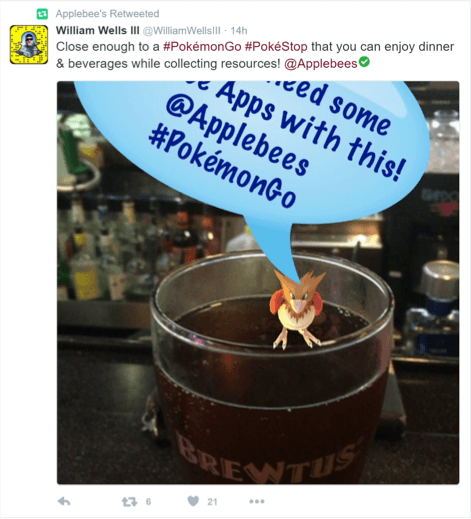 How Can Brands Capitalize on Pokémon GO? The Pokémon GO craze is real. So far around 7.5 million people in the U.S. have downloaded the app and players are already spending more time with the game than they are on Snapchat, Twitter and even Facebook. But what’s the opportunity for brand marketers and how can they capitalize on those highly engaged users who just gotta catch ‘em all? We asked our RockStars to share their thoughts. Oh, and if you know where a Pikachu is let us know! Influencer marketing is one of the fastest growing marketing channels. In fact 84% of marketers surveyed by eMarketer said they were planning to launch an influencer campaign within 12 months. And, in general, that investment is paying off. Data from RhythmOne found that average earned media value from US influencer marketing programs was 1.4 times as high in H1 2015 as the average in all of 2014, at $9.60 for every $1 spent, vs. $6.85 the previous year. However, influencers with the most followers don’t necessarily get the most likes which is why identifying the right influencers is cited as the biggest challenge when rolling out an influencer engagement strategy. So with that in mind we asked our RockStars – Are Influencers Influencing?